“Those, celestial bodies are called the planets (Grahas) that move through the Nakshatras (or asterisms) along the Zodiac (Bhachakra). The Zodiac comprises of 27 asterisms from Aswin to Revati and also divided in 12 equal parts known as signs (Rashis) from Aries to Pisces. The Zodiac sign which contains the rising (ascending) point at the time of Birth is called Lagna (ascendant)”. Based on the ascendant and the planets joining and separating from each other, the native’s good and bad fortune is deducted”. Parasara has given the concept of Bhavas (houses) along with 12 signs in the above narration. This is called the compartmental system of houses. In this, system the whole sign in which the degree of ascendant falls is considered the first house and subsequent sign as 2nd house and so on. The longitude of the ascending point becomes the most sensitive points of the ascendant i.e.1st house, and the sensitive points of other house will be 30° apart. The sensitive point of 10th house will fall in 10th sign from ascending sign and will have the same longitude as that of the ascending point in Lagna. In this system M.C. is not considered as the Mid-point or cusp of 10th house. M.C. is however given prime-importance due to it and is widely used for many other important purposes. Parasara continued to narrate the description of the planets, signs, various Kinds of ascendants, up-Grahas and importance of Deeptamsa of 15° on either side of sensitive-point of ascendant and other houses etc. (Deeptamsa means an effective Zone of 15° on either side of the sensitive-point of ascendant ,or sensitive points of other houses). After listening to the above narration, Maitreya enquired from Sage Parasara: These Slokas are of great significance and lay down the basis of Parasari Astrology: In this scheame, the nativity (sign chart) also acts as one of the Bhava chart. The other 15 kinds of Bhava Vargas (divisional charts) are for different purposes and these can be obtained by dividing signs (Rashis) into components and then arranging these components in a specified harmonic order. The division of any Varga chart that contains ascending degree will act first Bhava of that varga. Each Varga chart will have 12 Bhavas. The each house of a varga will be identified by a Zodiac sign and will be called the abode of the sign lord. Brihatparasharhorashastra gives clear instruction for construction of each Varga. In this manner each sign is divided in 150 unequal parts (the arc of largest part is 30’ and smallest is 1’40”) and each part will have specific characteristics, which could be ascertained by constructing separate divisional charts. (This also laid down the foundation of Nadi Astrology) in the life of the native. Each of the 16 divisional charts consists of 12 houses, assigned to a Zodiacal sign, which is in turn owned by a planet. (D-2 (Hora chart) and D-30 (Trimsamsa chart) are exception to the rule. On account of this reason, the concept of Vargottama is not studied in this article w.r.t. Hora and Trimsamsa charts at this stage). In chapter 14 (Ashraya Adhyay), in Laghu Jataka, Varaha Mihira has mentioned Two slokas (Verses) on Rajayoga, which are very significant. I am reproducing both the slokas for the benefit of the Savants. 1. If Moon or Lagna Rashi is Vargottama and aspected by four or more planets, the native becomes king if he is born in kingly family. (Obviously if aspecting planets are friendly to the aspected Planet or sign and if these are strongly disposed, the powerful Raja-Yoga is bound to be generated). 2. The native will attain or inherit the kingly status in the directional period of most powerful planet forming the Raja-Yoga. 3. The Vargottama Moon or Lagna help the native to attain the kingly status if they receive the aspect of other planet (s). 4. Logically, whenever any Vargottama planet (other than Moon or Lagan point) will be aspected by other planet(s), auspicious results will also accrue according to the signification of planet or Divisional Chart. 5. It may be worth nothing that the exalted planet gives good results when aspected by friendly planet (s). This is not the precondition for Vargottama planet that they should be aspected by a friendly planet (s). This means if a Vargottama planet is aspected by any planet(s), the auspicious results will accrue. What is the concept of Vargottama? As mentioned earlier in this article, the three basic constituents which stimulate events in a nativity are (1) Houses (Bhavas) (2) Signs (Rashis) (3) Planets. The native obtains the results through houses, but with the active assistance of signs and planets. The results of any planetary configuration or yogas are felt by the native through the Bhavas (houses) only. 1. The planet is called Vargottama, when placed in same zodiacal sign in any two Vargas. However, if planets become Vargottama either in Sign/Navamsa charts or in Sign/Dreshkanna charts, they become comparatively more auspicious and capable to confer Raja-Yoga provided other conditions prevail (such as aspect of other planets). 2. If Lagna Bhava of two Vargas obtains the same sign, this is called Varga Vargottama, as all houses in both Vargas will fall in same signs. 3. Similarly, if a planet is in same house (Bhava) in the two Vargas, it also enhances the auspicious results of these two Vargas according to specific portfolios of the concerned Vargas, and these planets are called Bhava Vargottama. The first two classification of Vargottama are commonly discussed in Jatak Granth’s and subsequent astrological literature. But, the third version of Vargottama, which is also more powerful and equally important, does not get the attention it deserves. This may have happened mainly on account of the reason because a group of astrologers, in last 1500 years, started suggesting number of ways for the construction of houses. These methods are at variance with the method suggested by Maharishi Parasara, sage Satyacharya and Acharya Varaha Mihira. The method advocated by Parasara is already explained in this article. Signs and houses are inseparable from each other. In all varga (divisional) charts, each house will be owned by a planet. The rising (ascending point) falling in the sign will become the ascendant of the respective varga chart. 3. True longitudes of Rahu / Ketu are adopted in this study. The presence of other auspicious yogas will enhance the good results and vice-versa. The principle of Argala and Upchaya will play important role in predicting the events .e.g a malefic Vargottama planet in 3rd house will enhance the significance of concerned varga chart,e.g. if such planet in bhava vargottama in D-1 and D-24, this planet will enhance educational prospects. Vargottama malefic planets in 3rd and 6th houses show beneficial results. If planet is benefic and placed in these houses, the good results may not occur easily. The Vimshottari Dasa is adopted in this study. The events occur in major, sub or sub-sub periods of Vargottama planets. Whenever a planet is in sign vargottama, it enhances auspicious results connected with its own signification as well as the significance of concerned varga chart. If vargottama planet is aspected by other planet(s), it may help to generate Raj-Yoga. Similarly, if Ascendant of two Vargas fall in same sign and aspected by planets in both vargas, it helps the native to enhance the status of the native with the help of signification and portfolio of two concerned Vargas, e.g. a house Vargottama planet in D-9 and D-4 charts, may indicate acquisition of property and fortune with the help of spouse or in-laws family. When a planet is in House Vargottama, it helps to acquire the benefit results according to signification of the Vargas. e.g. If a planet is in Bhava Vargottama in D-1/D-9, it may help in marriage, in case of D-1/D-10 chart- rise in professional status, in D-24 success in education and so on. This study is made based on Vimshottari dasa system, therefore, the planetary aspects are considered as per dictums of Laghu-Parasari. All the nine planets will aspect seventh house. Mars, Jupiter and Saturn have special aspects. Mars aspects 4th and 8th houses also, Jupiter 5th and 9th houses and Saturn 3rd and 10th houses, in addition to their seventh house aspect. As per the dictum of Laghu-Jataka, Raja-Yogas are examined vis-à-vis Vargottama planets and signs. The Raja-Yoga will become operative if other planet(s) aspect the Vargottama planets and/or signs. If, the aspecting planets are in some kind of sambandha (mutual relation-ship), the Raja-Yoga will be stronger, auspicious and lasting. The Sambandha of three kinds are considered in this study (a) mutual aspect (b) exchange of signs (c) conjunction of planets in one sign. Ex-1 Male: 27.01.1956, 23:00 hrs (1ST) 77E13, 28N39 Time Zone 5:30 hrs., Nakshatra: Pushyami 4 charan, Balance Saturn period 2 yrs 3 Months 10 days. Saturn is in Bhava Vargottama in D-1, D-9 and D-24 charts and is aspected by several planets. Saturn being a natural malefic is giving strong and auspicious Argala to their respective ascendants from 3rd house. The above combination will enhance the educational carrier and the marriage prospects. The cancer ascendant is Vargottama in D-9 and D-7 charts. This indicates the marriage should be productive and the native will have inherent creative capability. Mercury/Saturn Period – 27.6.1972 to 7.3.1975. The native was successful in a tough competitive examination and admitted in civil engineering course in I.I.T. The native again joined the prestigious course in financial Management in I.I.T. The native joined courses in Astrology. In Navamsa chart, Bhava Vargottama Saturn is aspected by exalted Venus and also Jupiter. The Saturn is the lord of 7th house in D-9 chart and its dispositor Mercury is again hammed by Venus and Jupiter. The native was married in March 1985 in Venus/Venus/Mercury period (5.11.1984 to 26.4.1985). Venus and Mercury are the part of yoga formed in D-1 and D-9 charts. The spouse is very learned and holds high position in a Medical Institute. D-9 and D-7 are in Rashi Vargottama and Cancer sign is rising both in D-9 and D-7 charts. The native was blessed with a son in Venus/Mars dasa (6.3.1988 to 6.5.1989) on 26.10.1988. The ascendant of D-7 is hammed by Mars and Venus. Vargottam ascending sign both in D-9 ad D-7 indicate the attachment among the spouse and progeny. Mars is also sign Vargottama in D-1 and D-9 chart and placed in fifth house in D-9 chart. Mars and owns fifth house in D-7 chart. Mercury period was in operation upto the age of 14 years. Mercury is Atmakarka and is placed in the ascendant of D-9 chart. Mercury is also sign Vargottama in D-9 and D-7 charts and in its sign of exaltation. This is an auspicious placement, particularly when Mercury is aspected and associated with other planets This helps the native to improve his skills with the assistance of his own inherent creativity. The placement of Mercury in third house of D-7 chart is not very helpful being a benefic in 3rd house. Major period of Ketu – 14-10-1944 to 13-10-2001. Ketu is in house Vargottama in D-1 and D-24 and providing auspicious Argala from 3rd house on the ascendants of both charts. Ketu is aspected by lagna lord Mars and Venus/Rahu in D-1 chart. Ketu is conjoined with Venus, Mars and Rahu and also aspected by Jupiter in D-24 Chart. Ketu’s major period was ruling from the age of 14 to 21 years. Ketu provided the native with good educational background which helped him to get good job in respected private enterprise. The sign Scorpio is rising both in D-1 and D-3 charts. The Sun and Saturn are sign and house Vargottama in these charts and aspected by several planets (Mercury and Moon in D-1 charts and Ketu, Venus and Rahu in D-3 charts). Mercury is exalted in D-1 chart and Venus is exalted in D-3 chart. Venus is Karka of sister and strengthening the Yoga by its aspect on sun in D-3 chart. His sister was married in Venus/Sun period (operating from 19-2-2005 to 19-2-2006) with the active help and assistance of the native. The couple was married on 27.11.2005. The husband was running Rahu major period. Rahu is placed in 8th house in Navamsa chart but is Bhava and sign Vargottama. The wife was running Ketu dasa. Ketu is placed in 6th house, but in sign Vargottama. Husband: 26.8.1979, 16.43 PM 77E13, 28N39 TZ 5.30 hrs. Nakshatra: Hasta 3 Charan. Moon- major period balance at Birth 2 yrs 7 m 15 days. The Capricorn sign is rising and Vargottama in both D-1 and D-9 charts. This indicates strong attachment among the couple. Rahu and Ketu are in house and sign Vargottama and placed in 2/8th house axis. Rahu is with 8th lord SUN, Yoga-Karka Venus and Ascendant lord Saturn. The native was married on 27.11.2005 in Rahu/Moon/Venus directional period though Rahu is placed in 8th house in D-9 cart. Besides Rahu which is Vargottama, Moon is the lord of Seventh house and conjunct with Dara Karka SUN and Venus in D-9 chart. Wife: 1.10.1972, 15:45 PM, 77E13, 28N39 TZ. 5.30 hrs. Nakshatra: Pushyami 1 charan Balance period of Saturn at Birth –16 yrs 1m 26days. There are following interesting features in this nativity. Saturn is Atma Karka and occupying Navamsa Lagna. Ascendant sign of wife in D-1 chart is the rising sign in Navamsa chart of husband. Rahu and Ketu are Rashi Vargottama and Venus is Bhava Vargottama. All these planets are aspected by Jupiter in D-1 chart. 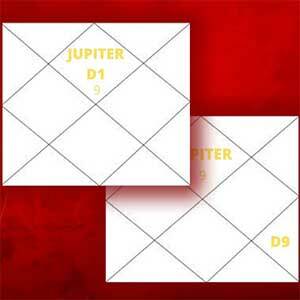 Rahu is Dara Karka and is conjunct with Jupiter in D-1 chart and Ketu is conjunct with Jupiter in D-9 chart. Jupiter is 7th lord in D-9 chart. Jupiter is therefore very important and strong yoga-karta for the marriage in this nativity. The marriage was negotiated in the period of Mercury/Saturn/Jupiter, Mercury and Saturn are Ascendant lords of D-9 and D-1 charts respectively. The Jupiter, being the Yoga-Karta, has made all arrangements for marriage in this nativity. The marriage was performed on 27.11.2005 on commencement of Ketu/Ketu/Ketu period. The dasa of Ketu commenced on the day of marriage. This example clearly establishes the role of Rashi and Bhava Vargottama Planets provided they are aspected by other planets. When ever Venus is in Leo, and sun and/or moon are in Cancer sign, this yoga does not help marriage. But on account of strength of Vargottama planets, the marriage did take place. Venus is house Vargottama in D-1 and D-9 charts. Besides, 7th lord Moon in D-1 chart is conjunct with up-pada lord Mercury in D-9 chart. Because of placement of Moon and Mars in 7th house of D-1 and D-9 charts respectively, the husband is much younger in age compared to the age of native.